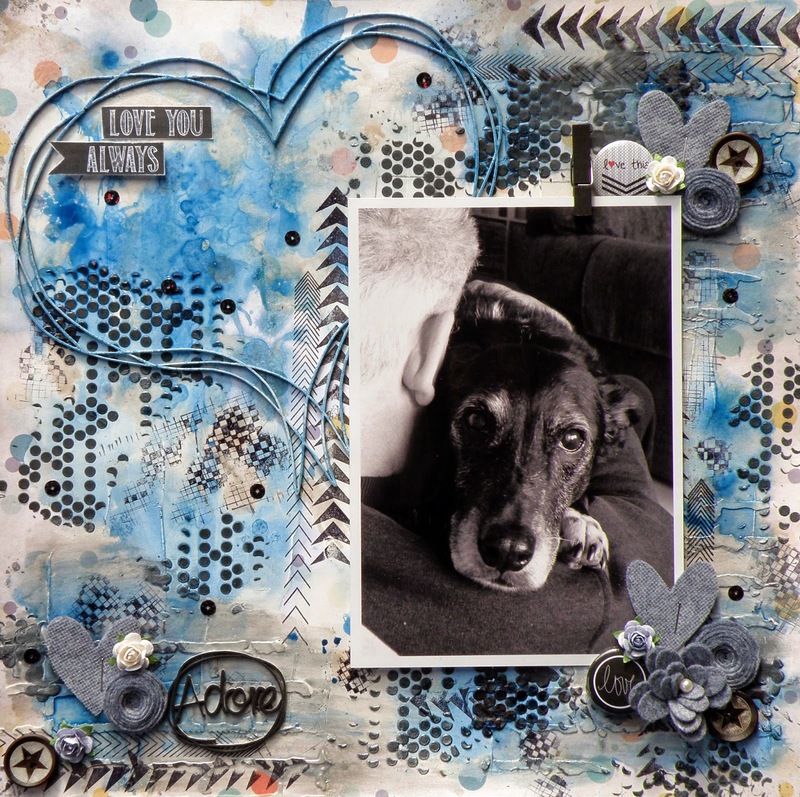 The challenge this month at Scrap The Boys is to create a layout using a 5x7 (or larger) photo. I have gotten so used to scrapping with 3x4 photos that lately I've 'almost' struggled with 4x6 photos! So this seemed the perfect challenge to throw me way outside my comfort zone, and I loved it! Its been a while since I've done a full on mixed media, grungy page and I loved it. Apart from the patterned paper I used for my background, and some chipboard, the rest of my layout is comprised of D-lish Scraps embellishments. A quick note before I list those embellishments. Ordinarily when I use this quantity of mixed media I create my layout on a chipboard sheet sprayed with gesso. In this instance though I've used a heavy weight patterned paper from My Mind's Eye. I hadn't planned on so many mediums, hence the patterned paper choice, and I'm rather pleasantly surprised at how well it held up! 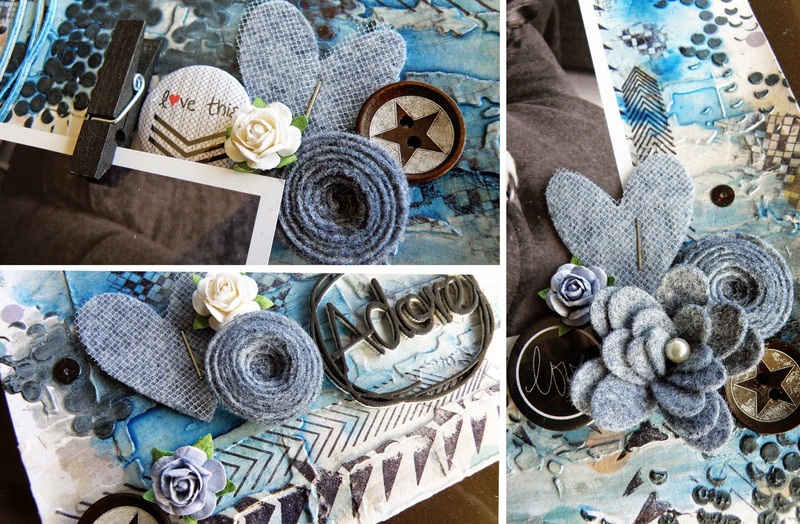 So, getting back to the D-lish Scraps embellishments I've used .. black Sequins, Flair Buttons from the 2014 Script Words in black and the Duly Noted packs, Chalk Folded Banners Journal Its, Wooden Star Buttons, mini purple Roses and a black mini Wooden Peg. I've also used white tulle (not yet listed in store) to create my heart embellishments. This is I think the third layout I've used the tulle on and I am finding it to be ever so versatile. The first two layouts I simply cut strips of the tulle to tie into bows. On this layout I've used it with felt to die-cut heart embellishments. My next layout will also feature tulle, used in yet another way. Anyways enough rambling about my layout LOL! I have loved creating it and am thankful to the team at Scrap The Boys for the inspiration. If you think you'd like to give their current challenge a go you can find all the details HERE. Oh wow! This is totally stunning! This looks wonderful.. love your back ground MM.. and what a special photo too.. I hope you have a good weekend! Great take on the challenge... and I assume your dog is a Male LOL....Great use of textures. Thanks for Playing along. It is awesome Al, love everything about it. Thanks for playing along with STB. This is amazing Alz, it's a beautiful photo of Max, the layout is perfect.